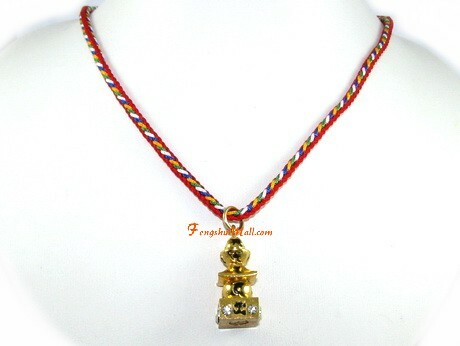 A perfect protection against various malicious 5-Yellow star which creates accidents and monetary loss. 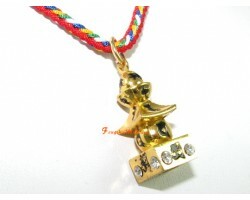 A high quality Five Element Pagoda pendant made of zinc alloy and gold plated. On its body is engraved with protection mantra that helps safeguards the wearer from tragedy, natural disasters and mishaps. 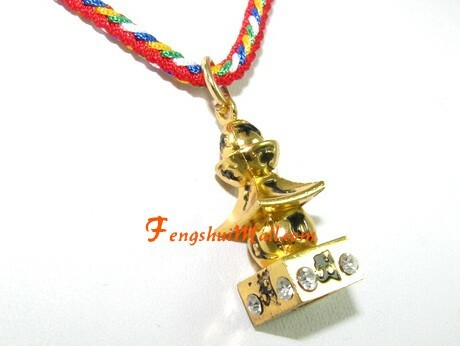 In comparison to other Feng Shui cures, such as the wind chime or Wu Lou, the Feng Shui Master’s Five Element Pagoda pendant is a far more potent and efficient cure for negative chi brought by Flying Stars of earth element. Its clever design and alloy composition, a symbol of the tough Metal element, are ideal to repress intense Earth energy which arises from Misfortune #5-yellow and Illness Star #2 in Period 8. The Five Element Pagoda is the essential Feng Shui cure to both take in and diffuse negative energy in the area around it. It is also the perfect protection against various malicious stars, such as the 5-Yellow star which creates accidents and monetary loss. This Five Element Pagoda was uniquely created for Period 8 (2004 – 2024), with the purpose of preventing the evil effects of Flying Stars # 2 and # 5. All products from our Feng Shui store are cleansed and infused with positive energy before shipping.